Start off your visit on the 7th (Fri): admire the masterpieces at Royal Palace of Madrid, then browse the eclectic array of goods at Mercado San Miguel, and then examine the collection at Prado National Museum. Get ready for a full day of sightseeing on the 8th (Sat): see the interesting displays at Museo Nacional Thyssen-Bornemisza, explore the world behind art at Museo Nacional Centro de Arte Reina Sofia, and then explore the activities along Retiro Park. Uberlandia, Brazil to Madrid is an approximately 15.5-hour flight. You can also do a combination of bus and flight. Traveling from Uberlandia to Madrid, you'll lose 4 hours due to the time zone difference. Traveling from Uberlandia in June, expect nights in Madrid to be about the same, around 19°C, while days are a bit warmer, around 36°C. Wrap up your sightseeing on the 8th (Sat) early enough to take a train to Barcelona. For shopping fun, head to La Boqueria or MACBA- Museo de Arte Moderno de Barcelona. Let the collections at Casa Batllo and Casa Mila - La Pedrera capture your imagination. Spend the 11th (Tue) among aquatic life with a scuba or snorkeling tour. There's much more to do: stroll through Parc Guell, admire the landmark architecture of Basilica of the Sagrada Familia, wander the streets of El Barri Gòtic, and take in the architecture and atmosphere at Barcelona Cathedral. To find reviews, traveler tips, where to stay, and other tourist information, you can read our Barcelona route planner. Take a train from Madrid to Barcelona in 3 hours. Alternatively, you can fly; or drive. When traveling from Madrid in June, plan for a bit cooler days and about the same nights in Barcelona: temperatures range from 30°C by day to 22°C at night. Finish your sightseeing early on the 11th (Tue) to allow enough time to travel to Ibiza Town. On the 12th (Wed), kick back and relax at Platja de ses Salines, then pause for some serene contemplation at Ibiza Cathedral, then explore the historical opulence of Castle of Ibiza, and finally see the interesting displays at Necropolis del Puig des Molins. Discover how to plan a Ibiza Town trip in just a few steps with Inspirock's itinerary builder. Traveling by flight from Barcelona to Ibiza Town takes 3 hours. Alternatively, you can ride a ferry; or do a combination of bus and ferry. 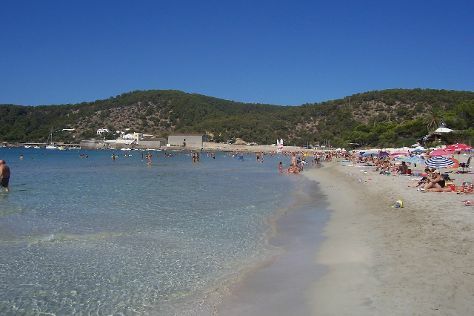 In June, daytime highs in Ibiza Town are 32°C, while nighttime lows are 21°C. Wrap up your sightseeing on the 12th (Wed) to allow time to travel to Seville. 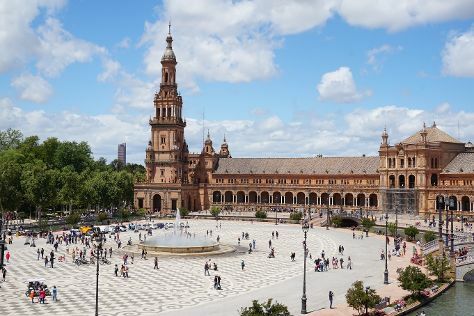 Start off your visit on the 13th (Thu): steep yourself in history at Plaza de Toros de la Maestranza, browse the exhibits of Museum of Fine Arts, Sevilla, and then admire the landmark architecture of Plaza de Espana. Here are some ideas for day two: step into the grandiose world of Royal Alcázar of Seville, then wander the streets of Barrio Santa Cruz, and then get great views at Seville Cathedral. To find traveler tips, reviews, maps, and tourist information, read our Seville trip itinerary planner. Fly from Ibiza Town to Seville in 3 hours. Alternatively, you can do a combination of ferry and car; or do a combination of ferry and train. In June, daily temperatures in Seville can reach 35°C, while at night they dip to 20°C. Wrap up your sightseeing on the 14th (Fri) to allow time to travel to Lisbon. Give yourself a bit of retail therapy at Museu Calouste Gulbenkian and Avenida da Liberdade. 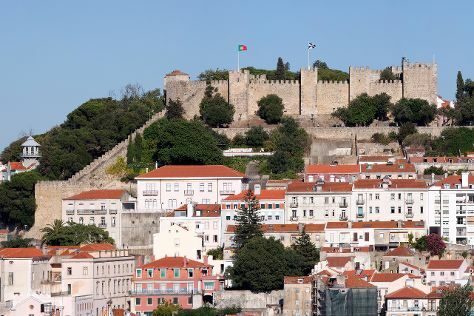 Do some cultural sightseeing at Jeronimos Monastery and Castelo de S. Jorge. You'll find plenty of places to visit near Lisbon: Sintra (Quinta da Regaleira, Park and National Palace of Pena, & more). There's more to do: take a stroll through Belém Tower and admire the masterpieces at National Tile Museum. To see ratings, more things to do, reviews, and tourist information, read our Lisbon attractions planner. Traveling by flight from Seville to Lisbon takes 4 hours. Alternatively, you can drive; or do a combination of bus and flight. The time zone changes from Central European Time to Western European Time, which is usually a -1 hour difference. Expect little chillier weather when traveling from Seville in June: highs in Lisbon hover around 32°C, while lows dip to 18°C. Wrap up your sightseeing by early afternoon on the 18th (Tue) to allow time for travel back home.